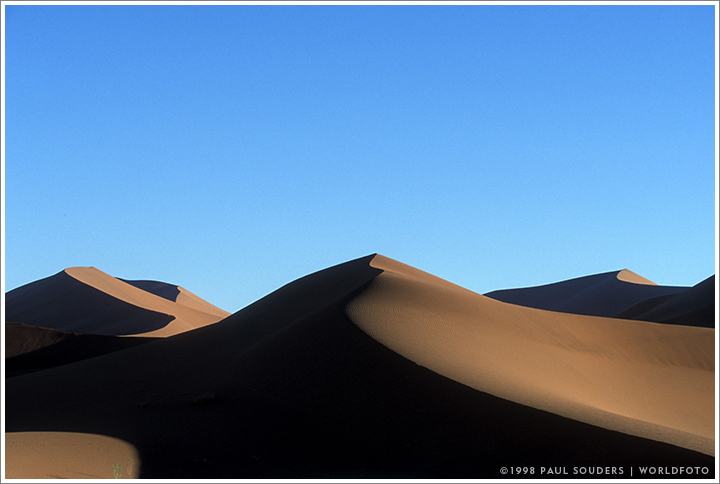 The morning sun lights huge red sand dunes at Sossusvlei in Namibia’s Namib Naukluft National Park. Photographed May 15, 2006 with a Canon EOS-1 camera and 70-200mm f/2.8 lens on Fujichrome Velvia slide film. This entry was posted on Wednesday, February 17th, 1999 at 7:53 am. It is filed under On the Road and tagged with Africa, Deserts, Landscape, Namibia. You can follow any responses to this entry through the RSS 2.0 feed.